Remember Vince? The guy who brought you ShamWow, Slap Chop, and the Schticky? Well he’s back with a great new product. Now he has an all new cleaner with his name on it called InVinceable. It’s not just any ordinary cleaner but a powerful all-in-one cleaner that can replace a cupboard full of cleaners. InVinceable can be used as a general cleaner, to clean your kitchen, a tile cleaner, fabric cleaner, carpet cleaner, stain remover, and even a laundry booster. InVinceable isn’t just another bottle of a cleaner you use up and toss away. With InVinceable you pour in the included dissolvable powder into the Spray Bottle and add water to form the powerful cleaning solution. You can make 2 bottles of cleaning solution from a single set of InVinceable. This can help save you money on household cleaning solutions. InVinceable works great at cleaning almost your entire home. Use in the bathroom, the kitchen, to clean walls, floors, or for removing pet stains and other stains from the floor or furniture. There are no chemical bleaches inside, so it is self for pets. The InVinceable bottle also features superior V-Line Technology. This lets you spray the bottle in any direction whether it is upside down or right side up, or at angles. It also ensures you can spray up every last drop. 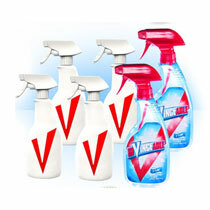 A single InVinceable set includes a V-Line Technology Spray Bottle and a 2-bottle supply of InVinceable Dissolvable Powder . It sells for $10 plus the cost of shipping and handling. But with this current buy 1 set get 1 set free offer, you can receive a second InVinceable set with 20 additional tables and another Spray Bottle for free. You just have to pay the extra shipping and handling for the free set.